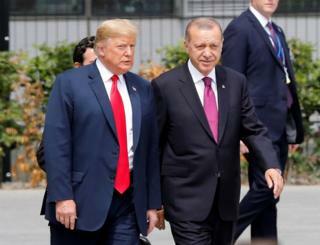 President Trump has doubled US tariffs on Turkish steel and aluminium, as the precipitous fall of the Turkish lira accelerates. The lira has lost around 20% of its value in the last 24 hours. In a televised speech on Friday, Turkish President Recep Tayyip Erdogan called on citizens to exchange foreign currency and gold for lira, calling it an “economic war”. “If they have their dollar, we have the people, we have Allah,” he said, as the lira continued to fall. The reaction from global currency markets to the rift between two Nato allies caused the euro to slump to a 13-month low and pushed the dollar to a one-year high. Officials from Mr Erdogan’s office said the two men “expressed pleasure” that relations between Turkey and Russia were progressing “positively” amid joint defence and energy projects. Diplomatic relations between the United States and Turkey have declined since the failed 2016 Turkish coup.